Veera Bhoga Vasantha Rayalu (2018) Veera Bhoga Vasantha Rayulu deals with three different subplots which run parallelly. One is about a young boy’s missing home and the other plot deals with a missing plane which is carrying Indian cricketers. The last and the key plot is about a series of kidnapping which is happening in Hyderabad. What’s interesting is that all the stories are interlinked in some way or the other. What are all these cases? What is the link between them? and what roles do Deepak Reddy(Nara Rohit), Neelima (Shriya Saran), Vinay (Sudheer Babu) and Sree Vishnu play in this setup? To know the answers, you need to watch the film on the big screen..
director indrasena written this story in a huge level aspect ,nara rohit and sudheer babu shreya saran and sree vishnu a big combo of actors are in this story ,coming to story sree visnhu was struggle from his child hood from criminals and he want to make some thing and after he grown takes a plan and killing the criminals and here nara rohith and shreya was cops challnge taken by sree vishnu ,screenplay is nice and audience want more excitement so its an average story. veera bhoga vasantha rayalu ,director indarasena .make movie a typical way.and how ever audience will impress the taking a negative shade ,how ever its an nice concept,sree vishnu as villan and remaing actors are done there best and climax will week to watch and so audience will not get intrested in the way. veera bhoga vasantha rayalu ,here sreevisnhu and nara rohit and shreya,sudheer babu was acted together ,in this story,director make movie.very interested way.here story and screenplay makes movie very higher way ,aduience will atract to watch but common audience will not agree this type so movie get a average talk. 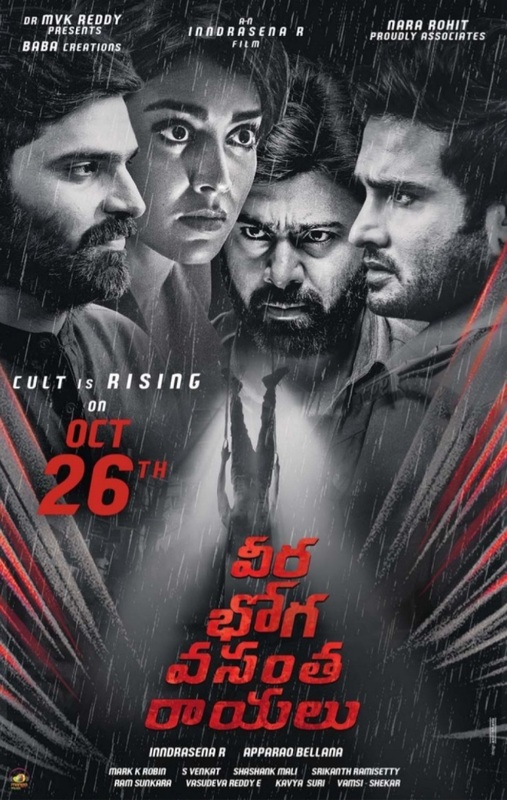 nara rohit was back with action entertainer ,shreya saran ,sreevishnu and sudheerbabu was main asset,director indrasena was create story very well so audience will enjoy the feast to watch this crazy story.so wait and watch on big screen. veera boga vasantha rayalu ,nara rohit and sudheer babu was combined together here coming to story movie is an action and thriller way ,music also robin he give his best ,so far movie was main a typical thriller way so audience will watch eagerly to watch this crazy combination. Veera Bhoga Vasantha Royalu' Begins On A Promising And Interesting Note But Soon Becomes A Pretentious..
On The Whole, It’s A Patient Tester; People May Go At Your Own Risk By Keeping Less Expectation. Nothing Is..
All In All, Veera Bhoga Vasantha Rayalu Is A Poorly Made Film With Weak Performances From Lead Actors And..
All In All, “Veera Bhoga Vasantha Rayalu” Is An Exercise To Look Different, But Its Clumsy Narration And.. While Sree Vishnu, Nara Rohith, Shriya Saran And Sudheer Babu Deliver Good Enough Performances, The Dubbing..
Veera Bhoga Vasantha Rayalu ‘is A Disengaging Mystery Film With A Lot Of Blood And Gore. With Poor.. The First Half Moves Like Different Short Films Chopped And Mixed Together While The Second Half Gets Even..
Veera Bhoga Vasantha Rayalu Team..
Veera Bhoga Vasantha Rayalu Logo..